Restore your energy as you munch on these healthy bite sized goodies. 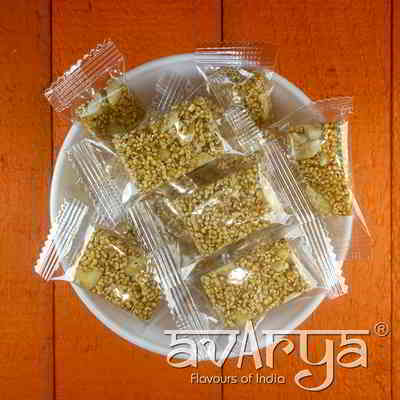 Avarya brings to you the One Bite Rajgira Chikki, which makes an ideal snack choice while travelling as they are easy to eat, without soiling your fingers. They do not spoil easily and can be stored for days. One Bite Rajgira Chikki	CT-CK-1031 Restore your energy as you munch on these healthy bite sized goodies. Avarya brings to you the One Bite Rajgira Chikki, which makes an ideal snack choice while travelling as they are easy to eat, without soiling your fingers. They do not spoil easily and can be stored for days. Rajgira, Jaggery, Sugar, Peanut & Liquid Glucose. The shelf life of One Bite Rajgira Chikki is 90 days.